Easily the most well known filmmaker of all time, Steven Spielberg has tackled all sorts of genres, with mostly superb results: from family friendly classics such as E.T. to genre establishing thrillers such as Jaws, Spielberg's works have also gone on to create flourishing franchises of all kinds and render him one of the film industry's most financially pleasing as well as creatively compelling directors. He's had a few a disappointments, which has to be expected in such a huge filmography, but this year's The BFG is likely one of the most upsetting and surprising to date - thanks to mediocre box office takings and a general mixed response from audiences. Based on the Roald Dahl book published in 1982, the story involves lonely orphan Sophie (Ruby Barnhill), who is whisked away from her orphanage by the titular gentle giant (Mark Rylance) when she catches sight of him during his midnight work - delivering and capturing dreams as people sleep. 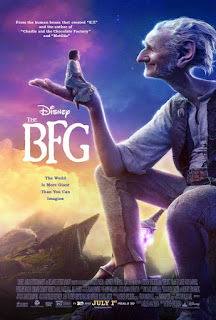 Fearing that returning Sophie home will risk exposure of himself and his homeland of Giant Country, the BFG decides to keep her as a companion, and the two form an unlikely friendship over time which soon leads to their eventual quest to rid Giant Country of the man eating monsters that dwell within it. The most notable thing about the film at first glance is it's extensive use of CGI to create the BFG himself, the Giant Country around him, and the other man eating beasts living in it. Rather than being animated purely from scratch, the BFG, as well as the other giants, are created using motion capture techniques - whilst this is certainly a tad creepy at first glance, it actually makes for some impressive results. Mark Rylance's performance is full of visible effort; he captures the vocal tone and the speech pattern of the BFG perfectly, and his expressions, as well as the effects generated around them, are just as believable. 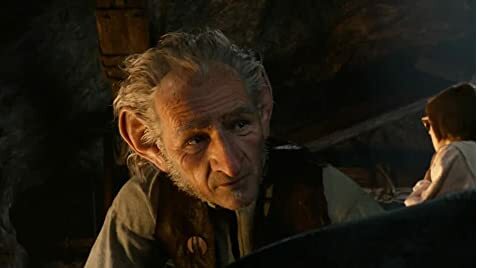 What is a shame, however, is that the BFG's overall characterization simply doesn't live up to the character's standards - he really doesn't seem that friendly from the get go, more like a miserable old man. This trait goes on for far too long, making him eventually dull and somewhat unlikeable, no matter how much talent Rylance clearly shows. It's strangely not until the film nears it's finale that his truly friendly side comes to fruition, which, again, leads to an unlikeable central character for a large portion of the story. When it comes to Barnhill as Sophie - well, considering this is her first major film, she is extremely talented, injecting plenty of humour and genuine emotion into her performance to render the character as a charming protagonist. Her physical integration into the CGI effects as she enters the Giant Country is truly superb, seamlessly generated and highly polished. But these passionate performances (even against weak characters) and amazing visuals can't then save the pacing of the story. The direction doesn't feel like the confidence of Spielberg whatsoever; he's crafted something that's often boring, overlong, and extremely sluggish, with a multitude of unnecessary scenes that serve no purpose but to drag out an underwritten narrative. Such rushed pacing also leads to a lack of emotional exploration during scenes that truly ask for it - too often major things happen, and you think it will result in a tender moment, but it's shrugged off and things move on as if nothing happened. It's truly a shame, as Spielberg was apt for the job considering the source material, but he just doesn't pull it off here; the end result is a boring experience that genuinely made me feel drowsy a few times the more it went on.